While the canon of art history is a monolithic force, some aspects of it are far from benign. Art history is billed as a treasure trove of virtuoso technique, stylistic innovation, and individual genius. A corollary implication is that artworks that survived to the present day did so because they possess such superior qualities. In terms of social justice, it is time to check that privilege. Svetlana Alpers once described a common attitude in art history as “equating all works as separate but equal pieces of history” while asking readers to consider the ramifications of that pretense of objective judgment (“Is Art History?” 10). However the canon came to exist, it is true that swathes of art history are dramatically altered when stripped of the privileged status of historical artifacts as morally neutral. As Susan Stewart observes, “the collection represents the total aestheticization of use value” (On Longing 151). When artworks’ “use value” (or personal signification) is rehabilitated, then our visual inheritance becomes more than expensive clip art. The canon is neither innocuous nor irrelevant to modern culture. Exposing the roots of visual tropes concomitantly highlights their modern incarnations and ramifications. 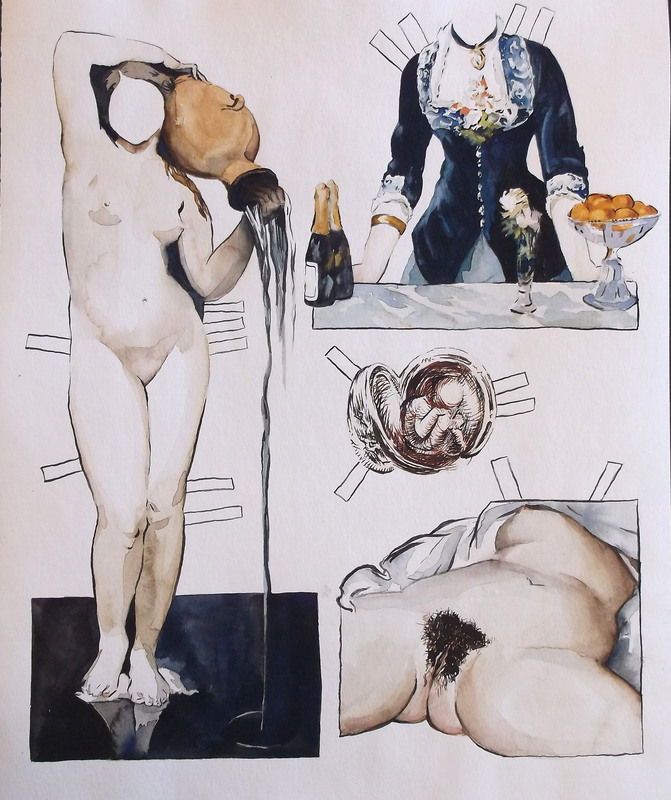 Two common strategies described by Nanette Salomon for addressing lingering imbalances and codified sexism in the canon of art history are “the excavation of women as creators” and “the appearance of women as critics and interpreters” (“The Art Historical Canon” 349). The latter process involves reexamining art through lenses to which it has rarely been subjected. When contemporary feminist concepts like Laura Mulvey’s theories of the male gaze are applied to the art canon, scholars such as Patricia Simons begin such revisions as “unmasking the apparent inevitability and neutrality of Renaissance art” (“Women in Frames” 4). One danger of such jargon in rhetoric is its exclusivity. In the previous example, references to the male gaze founder if the listener does not know that “the male gaze” presupposes a Lacanian employment of “the gaze.” When correctly understood, the emphasis of Lacan’s gaze is firmly transferred from the fact of being visible to a person’s awareness of being seen. The supposedly objective and neutral point of view highlighted by Alpers would be of little use in understanding the subjective and contemporary implications of the gaze in art. That subjectivity has observable consequences. Michel Foucault’s brilliant analysis of prisons and schools in Discipline & Punish illuminates how that awareness of being seen affects the behavior of those who know themselves to be under surveillance (and thereby subject to judgment and potential punishment). Through examining systems of control, Foucault reveals how “It is the fact of being constantly seen, of being able always to be seen, that maintains the disciplined individual in his subjection” (187). Foucault’s text shows how the gaze polices modern society. The canon of figurative art exerts a similar force. His essay shows the ubiquity of the male gaze in the European and American art canon and advertising, but leaves the effects or consequences of those assumptions up to his readers. Berger’s proposed mental experiment is the premise for my current body of paintings. 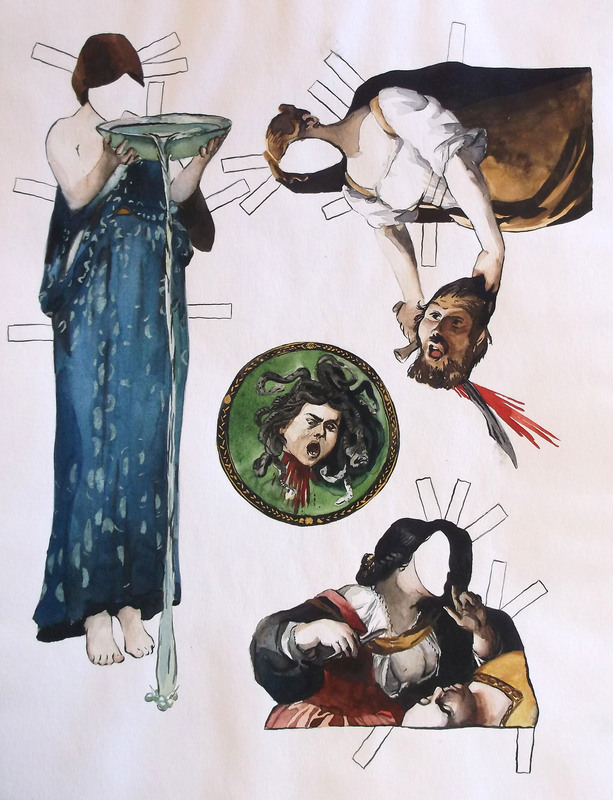 Rather than passively imagining a gender swap within the art history canon, I painted a collection of paper dolls by which to perform that drama. This project not only remixes art history, but recontextualizes it as costumes to be measured against a specific person. If the male gaze concerns how an individual reacts to being seen, then what happens when I see and am seen through these artistic windows? The violence predicted by Berger manifests in this project in several ways. The appropriation rips figures from their painted and historical contexts and backdrops. In return, my paper doppelgänger is forced to wear a number of iconic but biographically inappropriate personas. The blank faces are voids and tabs are straps by which to force these ideas onto myself. The product and process embraces the ridiculousness and difficulty of fitting an individual into these forms. The paper dolls’ interactivity highlights the fluidity of identity in more intentionally flawed and childlike ways than similar photographic transformations by Cindy Sherman and Yasumasa Morimura. Meaning and absurdity derive from the conceptual schism between the paper avatar and the costumes provided for her. La Source by Ingres and L’Origine du Monde by Courbet are particularly clear examples of that attitude in art. Fig. 1. The Matter that Matters: Dominique Ingres, Edouard Manet, Leonardo da Vinci, and Gustave Courbet. Watercolor. 11 x 15 in. Jan. 2014. The contrast between Ingres’s and Courbet’s nudes showcase a convention in the painterly treatment of women. As Berger reminds us, “…in the European tradition generally, the convention of not painting the hair on a woman’s body helps towards the same end. Hair is associated with sexual power, with passion” (55). He goes on to suggest that “The woman’s sexual passion needs to be minimized so that the spectator may feel that he has the monopoly on such passion,” but the absence of a head in Courbet’s painting has a similarly disempowering effect (55). Debates about body hair continue to the present day and are emphatically gendered. Although powerful, these women were still presented purely in terms of their value or threat to men (Fig. 2). Women were thus either thoroughly inferior or threatening. Fig. 2. Femmes Fatales: John William Waterhouse and Caravaggio. Watercolor. 11 x 15 in. Jan. 2014. Remember that the primary goal of these dolls and costumes is to explore the concept of the male gaze in art history with an emphasis on how it is felt. As Judith Butler put it in her preface to Gender Trouble, “The radical dependency of the masculine subject on the female ‘Other’ suddenly exposes his autonomy as illusory” (xxviii). Judith Butler’s insights into gender and identity as performative are completely relevant to this sincere fiction. We must expose these illusions because, as Dijkstra explains, “a work of art whose content is left unexamined…continues to have a dangerous power of persuasion” (ix). Each artwork in the canon may be no more than a minor assault on the self-image of its viewers, but neither women nor men should settle for a visual culture that fosters lies and resentment.